Veuve Moisans is a sparkling wine from France. Wine with bubbles is often called “champagne”, but while all champagne is bubbly wine not all bubbly wine is champagne. Only the bubbly wine produced in the Champagne region of France can be called “champagne”, while bubbly wine produced outside the Champagne region is known as “sparkling wine”. Veuve Moisans is a sparkling wine. 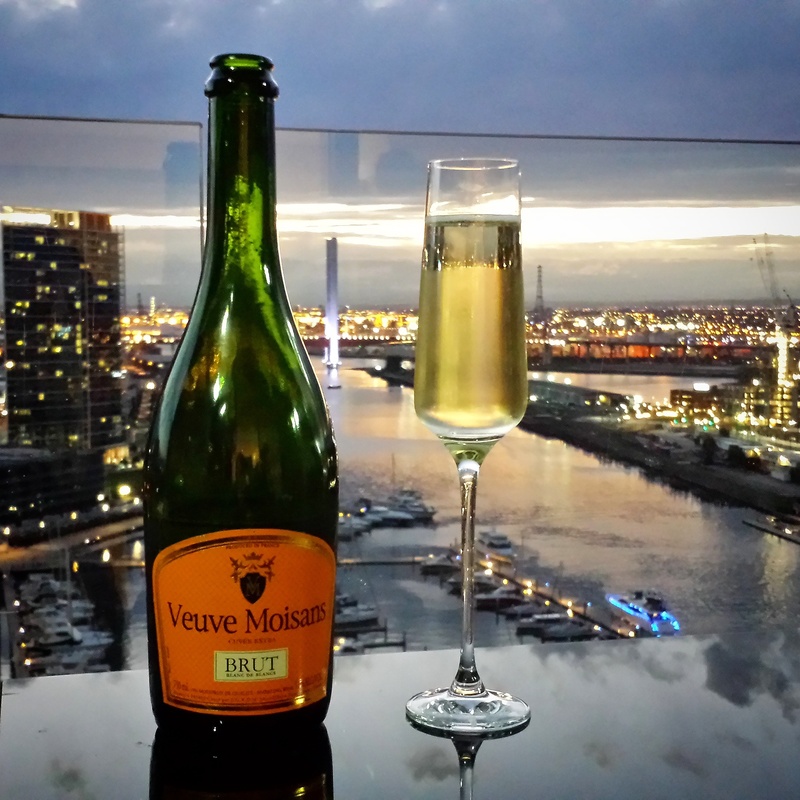 Malt Mileage has been fortunate to taste and review the Veuve Moisans Brut. “Brut” is a term used in wine speak to give consumers an idea of how dry a wine might be, because under European Union guidelines a “Brut” wine must have a sugar content of no more than 12 grams per litre (though there may be differences between “Brut” wine produced by different companies because the sugar content of the wine may vary). A “Brut” wine sits towards the drier end of the wine spectrum because from most dry to sweet, the classification of wine sweetness/dryness is as follows: Brut Nature (0-3 grams sugar per litre), Extra Brut (0-6 grams per litre), Brut (0-12 grams sugar per litre), Exra Dry/Extra Sec/Extra seco (12-17 grams sugar per litre), Dry/Sec/Seco (17-32 grams sugar per litre), Demi-Sec/Semi-seco (32-50 grams sugar per litre) and Doux/Sweet/Dulce (50+ grams sugar per litre). If a wine does not last very long on the table and it is quickly consumed, then it is a safe bet that the wine is very good. Between three separate tasters (including myself), the Veuve Moisans Brut vanished very quickly and within half an hour of the cork being popped the last few drops of this sparkling wine was happily consumed. The Veuve Moisans Brut, despite being labeled “Brut”, had a subtle dryness that was nicely balanced by the fruit in the wine which meant that it was very drinkable with or without food. It is, however, a sparkling wine that I would recommend be enjoyed with he right foods. The Veuve Moisans Brut was beautifully matched with spicy Chinese seafood dishes such as prawns, scallops and oysters with XO sauce or schezwan sauce, and, to my delight, my grandmother’s picante salami. The subtle but crisp dryness and fruity sweetness of the Veuve Moisans Brut complimented and accentuated the seafood while at the same time taming and cutting through the salt, pepper, chilli and oil in the food to refresh and clear the palate. Comparatively speaking, the Veuve Moisans Brut was very impressive and three of us unanimously agreed that it was among the most pleasant dry sparkling wines we have tasted. Having become quite familiar with Veuve Clicquot Brut Yellow, Dom Pérignon Brut and Moët & Chandon Brut Impérial over the years (devouring a bottle of these champagnes on special occasions such as on birthdays, new years eve, Christmas, graduations etc), the Veuve Moisans left us wondering why we ever bothered to spend more money than we had to for a good “Brut” sparkling wine. Veuve Moisans Brut is a beautifully balanced sparkling wine that is fresh, crisp, summery and vibrant with flavours of tart yellow peach that morph into sliced green apples, strawberry and sultana toward the finish, as floral undertones and a mild underripe stone fruit acidity shimmer in the distance. This entry was posted in Uncategorized and tagged Brut, champagne, France, sparkling wine, veuve moisans, wine. Bookmark the permalink.